How insulation resistance is measured? 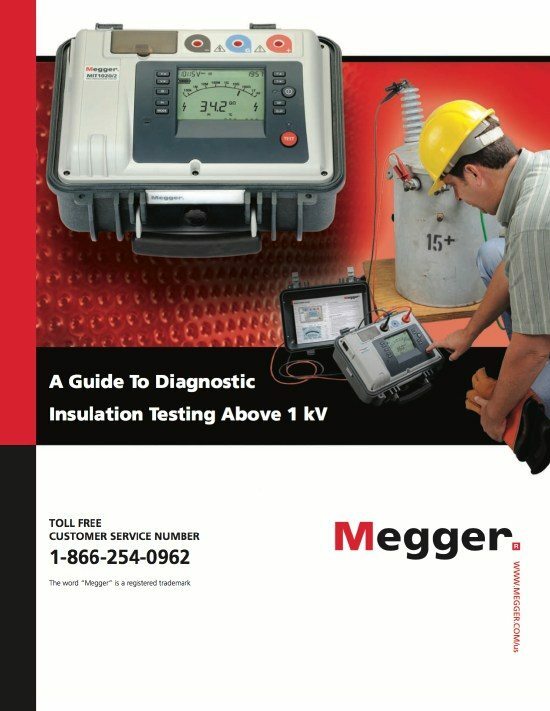 Insulation tester is a portable instrument that provides a direct reading of insulation resistance in ohms, megohms, gigohms, or teraohms (depending on the model chosen) regardless of the test voltage selected. 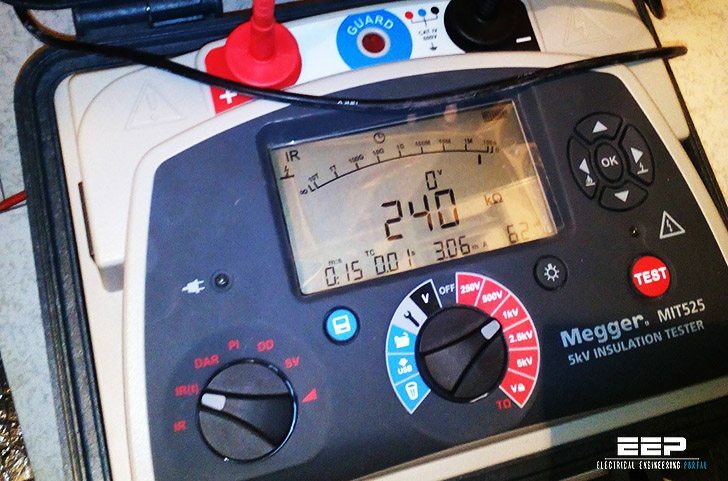 For good insulation, the resistance usually reads in the megohm or higher range. 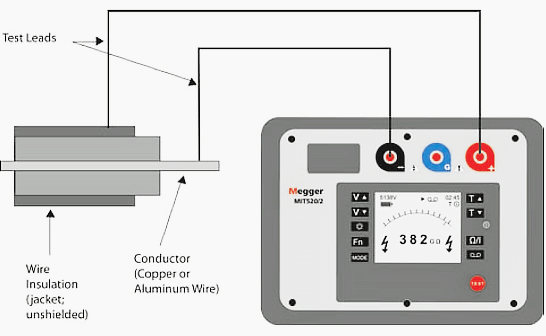 The Megger insulation tester is essentially a high-range resistance meter (ohmmeter) with a built-in DC generator. The instrument’s generator, which can be hand-cranked, battery or line-operated, develops a high DC voltage that causes several small currents through and over surfaces of the insulation being tested. The total current is measured by the ohmmeter, which has an analog indicating scale, digital readout or both. With modern insulating materials there is little, if any, difference in the reading obtained, regardless of which way the terminals are connected. However, on older insulation, a little known phenomenon called Electroendosmos is causes the lower reading to be obtained with the positive terminal connected to the grounded side of the insulation being tested. If testing an underground cable, the positive terminal would normally be connected to the outside of the cable since this will be grounded by contact with the soil, as shown in Figure 1 above. Please note that you do not connect directly to the insulation but rather to the cable’s neutral or ground. These informations that is actually helpful. Thanks for sharing for me. Good day For All. I try how many time to open using your mention website, still it doesn’t work, kindly re-fix the download link for this complete guide insulation test above 1Kv. Hello – please repair your download link. It doesn’t seem to be working for the Complete guide to diagnostic testing. I just checked and it works fine. Copy the URL ‘https://electrical-engineering-portal.com/download-center/books-and-guides/power-substations/insulation-testing-above-1kv’ in new tab of your browser and try again.